What is brief introduction on HZQ launching girder integrating carrying and installing girders? FAQ May 10, 2013 Comments Off on What is brief introduction on HZQ launching girder integrating carrying and installing girders? A set of middle legs and ground girders are added for launching girder integrating carrying and installing girders. The assembly of launching girder is firstly finished on the roadbed, then longitudinally move to cross spans. 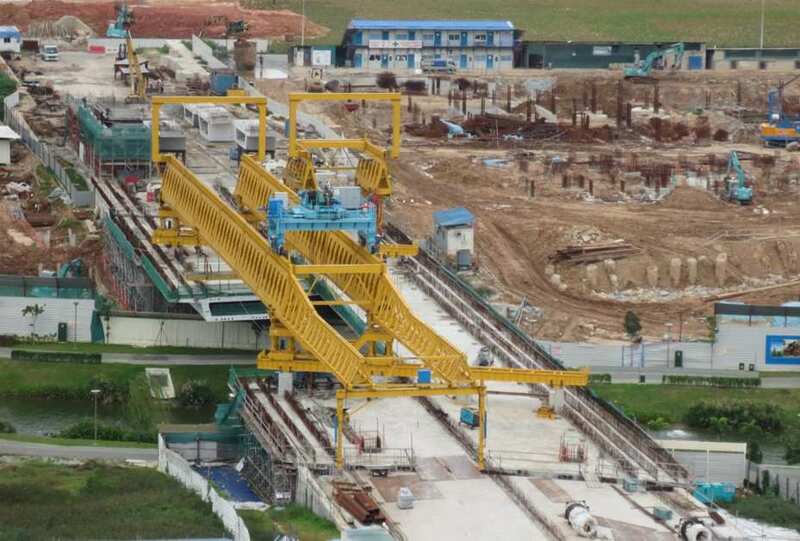 After front end of launching girder is supported, remove connection pins at middle of launching girder, thus the rear part of launching girder can move to the precast yard to carry girders. As precast girder is carried to the abutment, connected simply by rail clamping plates and bolts, lifting trolley lifts and moves precast girder to the front part of launching girder and put down precast girder. As installing boundary girders, firstly place precast girder in the position of middle girder, then use the method of single girder bearing loads to lift and longitudinally move the precast girder by hanging frame for lifting boundary girder and trolley to right position, thus finish installation of boundary girder.